Spragglesea Mead and Dean's Ham Allotment Association. Home Page. 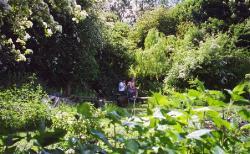 Our allotments are adjacent to Hinksey Park, South Oxford. For further information on site availability or other matters please contact one of our officials (see below). Please have a look at our environmental survey. Click here for the link. For email contacts use the above addresses and delete one of the @s.
Please contact David Helliwell (see above) if you wish to go on the waiting list. (Residents of South Oxford only please). Please have a look at our environmental survey, wild flowers, birds, butterflies. Click here for the link. Here are a few pictures of the allotments taken between Spring 2000 and Winter 2010. For an enlarged version, click on the 'here' caption below the picture. Dean's Ham on an autumn morning (left). 1. Mushrooms growing on wood chippings. (L). Autumn 2003. New Hinksey School Plot. Swans on the allotments in winter, December 2000. (L). Angelica in Spring 2001. Even more spectacular than the previous year, as it seemed to like the floods. (R). Chives in flower (and peonies). (L). Strawberries on the School Plot. (R). A picnic in Spring. This part of the allotment is a veritable paradise in sunshine. (L). Cardoons. These did not survive the floods and frost of winter 2002-3, but more are being grown. (R). The seven sisters in the park. A view of Delft by Ver Meer ? No, this is Dean's Ham in winter 2001, the meadow from which our allotment takes its name. (R). Teazels on the allotment. They are a native wild flower, but may be grown from seed. 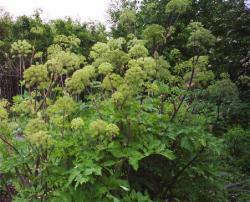 They are occasionally seen on roadside verges. (R). Left: A Painted Lady on Sedum. 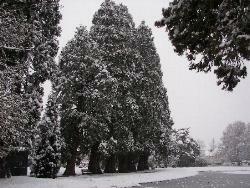 Right: The seven sisters in winter, 2005. Recipes (July 2003) are now available. Click here.